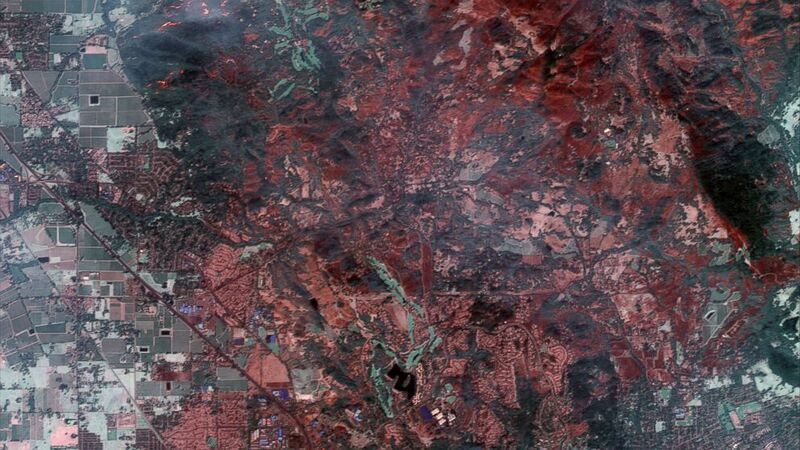 Shortwave infrared imagery makes it possible to see though the smoke. Firefighters are battling at least 22 wildfires across California today. The blazes have consumed more than 180,000 acres of land so far, killing at least 31 people and destroying thousands of homes. 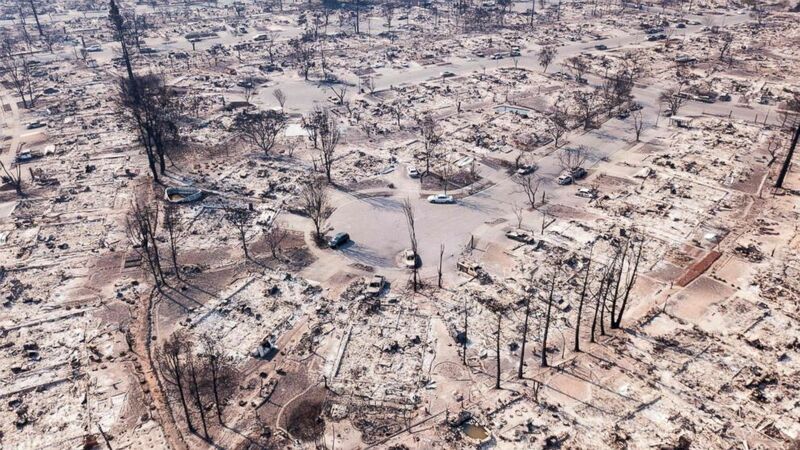 The satellite image above results from shortwave infrared technology to show the extent of damage in Santa Rosa, California, which is among the areas hardest hit by the fires in Southern California. The shortwave infrared imagery makes it possibly to see though smoke and identify active fires. 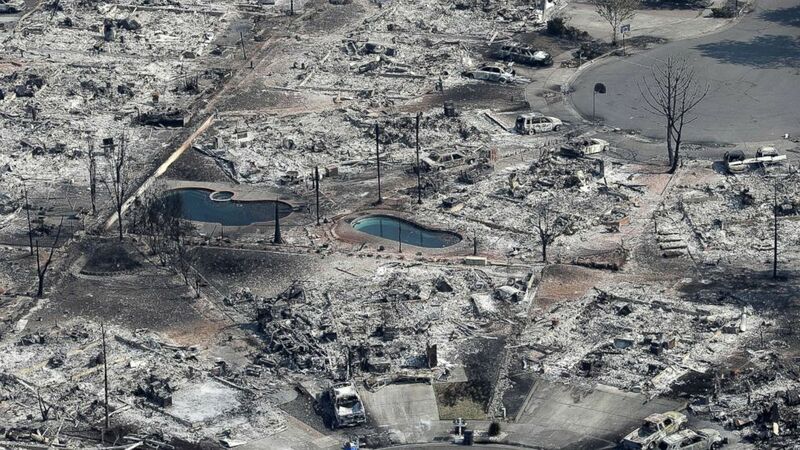 Dramatic aerials of the aftermath also show the widespread devastation across Santa Rosa. 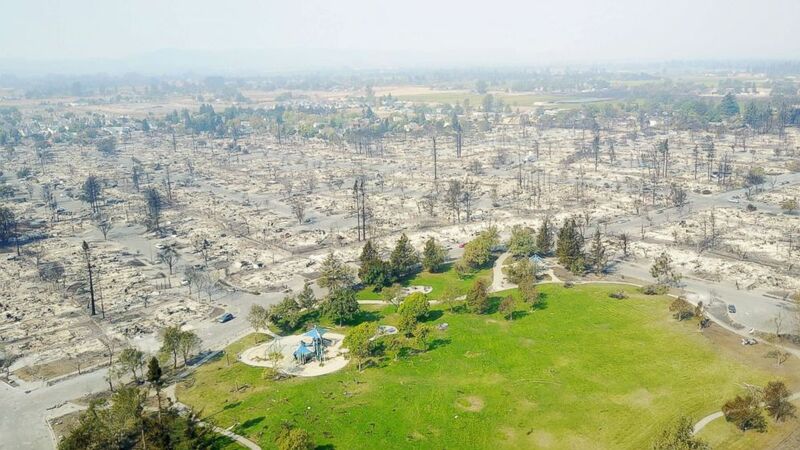 (Elijah Nouvelage/AFP/Getty Images) Fire damage is seen from the air in the Coffey Park neighborhood in Santa Rosa, Calif, Oct. 11, 2017. More than 200 fire engines and firefighting crews from around the country were being rushed to California to help battle the fires. (Justin Sullivan/Getty Images) Thousands of homes and businesses that were destroyed by the Tubbs fire in Santa Rosa, Calif., Oct. 11, 2017. 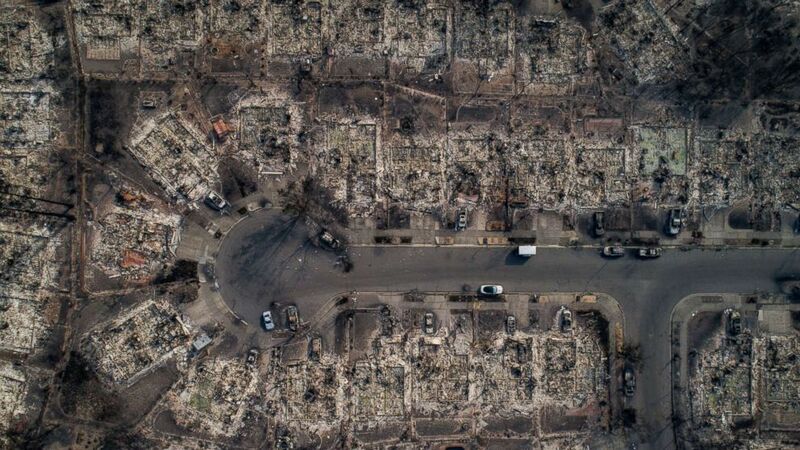 (Josh Haner/The New York Times via Redux) An aerial view of homes burned by wildfire in the Coffey Park neighborhood of Santa Rosa, Calif., Oct. 10, 2017. Fires charred countless acres in California's wine country. 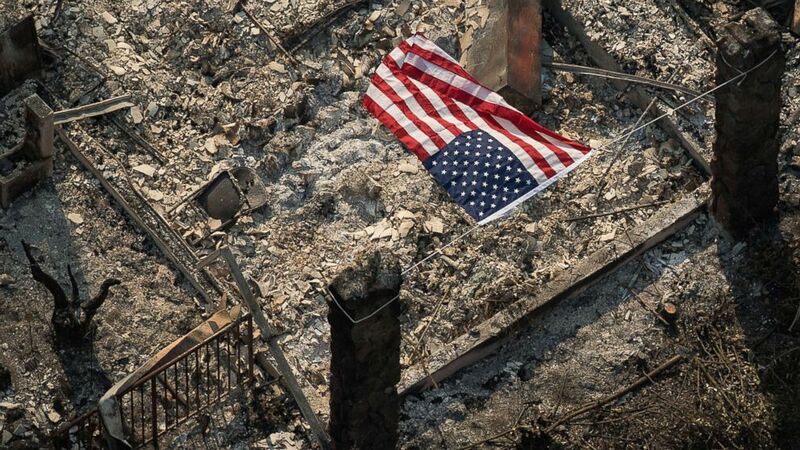 (Noah Berger/San Francisco Chronicle/Polaris) An American flag flies over the remains of a Coffey Park home following the Tubbs fire in Santa Rosa, Calif.
(Marcus Yam/Los Angeles Times/Polaris) An aerial view of a K-Mart destroyed by the wildfire along the 101 freeway in Santa Rosa, Calif., Oct. 11, 2017. 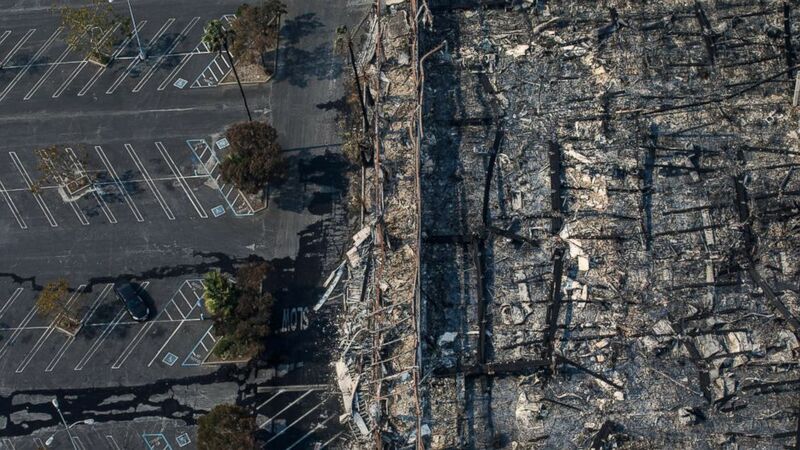 (DroneBase/Reuters) Damage caused by wildfires in Santa Rosa, Calif., Oct. 11, 2017.